The National Association for Music Education (NAfME) recently awarded MMEA the 2018 Excellence in Advocacy Award in recognition of their efforts advocating for music education. MMEA President Lisa Furman, along with Executive Director Cory Micheel-Mays and Immediate Past-President Karen Salvador, accepted the award on behalf of MMEA during NAfME’s June Hill Day activities. “The Michigan Music Education Association has learned the importance of being ‘in the room,'” said Lynn Tuttle, NAfME Director of Public Policy, Research, and Professional Development. MMEA has been a key player in several public policy discussions at the state level, including the writing and implementation of Michigan’s state ESSA plan. MMEA’s efforts led to a state ESSA plan that includes music and arts in their state accountability reporting system, as well as identifying music and arts as potential uses for federal Title IV-A funds. MMEA has also participated in an overhaul of Michigan’s teacher licensure program. In a span of sixteen months, MMEA was the only voice of fine arts education in the room. Our presence resulted in the preservation of the all-levels, all music teaching certificate and the removal of a clause allowing music to be taught by a non-music certified instructor. Additionally, MMEA’s participation led to the addition of Pre-K to the previous K-12 certificate in acknowledgement of the realities of many music educators. On March 20th of this year, we hosted the fourth annual Music Education Advocacy Day at the Michigan State Capitol. Joined by student musicians, parents, representatives of school music organizations, and business leaders, MMEA carried out meetings regarding equitable access to music instruction for all students PK-12 in MI, specifically urging adoption of legislation mandating K-5 general music instruction for all Michigan students. 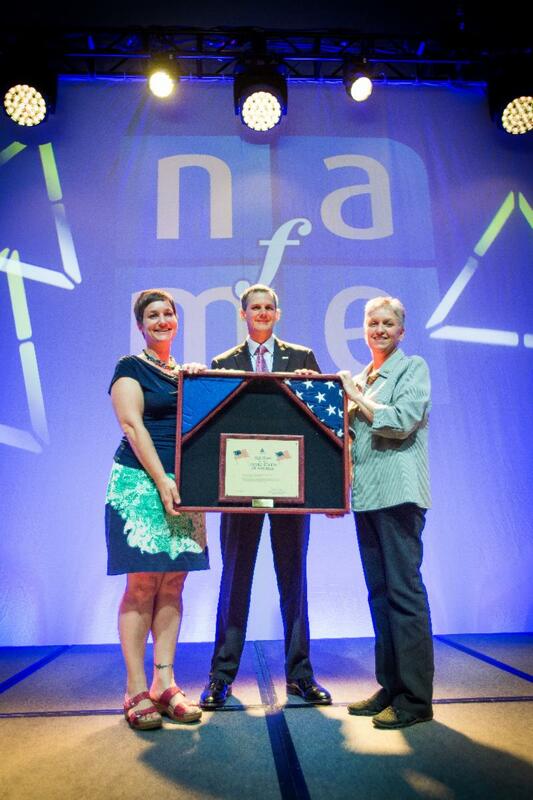 The Excellence in Advocacy award, presented annually at NAfME’s National Leadership Assembly, recognizes a state MEA for outstanding accomplishments in music education advocacy. State MEAs around the country are advocating by meeting with State Boards of Education, advocating to state legislatures, and engaging stakeholders. The 2017 Excellence in Advocacy Award recipient was North Carolina Music Educators Association. Congratulations to you, our MMEA members, constituents, and supporters. This award would not be possible without your tireless efforts, your amazing teaching, and your unwavering support for quality music education for ALL Michigan students!